Roughly three weeks ago, I asked the question, "is JREF getting rid of the forum?" And now I have the official answer from a JREF representative: Yes! "...the JREFers appear to be fixated only on smothering scientific debate under a blanket of NIST, FEMA, Kean, Fox and CNN “Truths”!...I have worked as a research scientist in industry and academia for MANY years but I do not recall ever witnessing such an endless appeal to authority, by one side in a debate, as I see with the JREFers! Indeed, I find the JREFers more often than not coming across as dogmatic followers of a creed. Thus, ironically they have become a modern band of Inquisitors doling out their autos-da-fe to heretic CTists for simply having the temerity to question NISTIAN authority." This is probably the most scathing review that a forum of self-proclaimed "skeptics" can possibly get, but the JREFers found a way to humiliate themselves even more: They ended up replacing Dr. Greening with an actual Christian minister! Reverend Chris Mohr has led the 9/11 sub-forum in recent years, "literally speaking gibberish." These people may not "get it" why they are such an embarrassment, but apparently the JREF has finally had enough. Dedicated JREF forum members have decided to attempt to continue the operation of the forum on their own, although a new name has not been chosen yet. Will they come up with something really sad like "the forum formerly known as the JREF forum"? The "ministry of truth" perhaps? Meanwhile, although he has not yet signed the AE911Truth petition, Dr. Greening is now openly skeptical about the official 9/11 narrative in general, and he acknowledges that the official collapse report for WTC 7 is rubbish. The NATO summit is only a few days away. 60 world leaders, including Barack Obama, meet in the UK on 4-5 September to plan their war on the world. From 30 August protesters will flock to South Wales for international actions including a national demonstration on 30 August, counter summits, and a week-long peace camp. We're already seeing how the summit is shaping up. Today's Guardian suggests David Cameron is planning to join Barack Obama in air strikes on Iraq and Syria. They plan to use the summit to whip up support for new wars in the Middle East. They also want to reverse the defeat suffered by Cameron in parliament last year when it voted not to go to war with Syria. In addition, the summit will be the occasion to further extend Nato's reach into eastern Europe, with the proposals to build nato bases in the Baltic states. The only non-Nato country head of state at the summit is the Ukrainian president, a clear sign of Nato's central involvement there. Meanwhile Cardiff and Newport are in lockdown to try to prevent protestors opposing the Nato warmongering agenda. Thousands of people from Wales and across the country will be embarking on a week of protest across the two cities. Please support as many of these events as you can. If you can't be with us in Wales for the No To Nato events, please consider making a donation to help us cover the extensive costs of transport, staging, banners, publicity and all the other expenses for the week. Moving from conflict to conflict in the Middle East, trying to keep up with the politics and players involved, the unrelenting violence, the rising death toll and refugee crisis, is as difficult as it is depressing. There is one common thread however – from Gaza to Syria to Iraq to Egypt to Libya to Afghanistan -- U.S. military intervention and an ever-ready supply of U.S weapons pouring into the region make matters worse. U.S. weapons provided to the Iraqi Army are now in the hands of extremists who are close to tearing the country apart. The success of the extremist offensive has led them to declare themselves the Islamic State, stretching into Syria where they have been fighting to overthrow the Assad government alongside other rebels being vetted by the U.S. to see who is worthy of receiving yet more U.S. weapons transfers, just what the region doesn’t need. The U.S. leads the world in weapons sales. That includes the sale of weapons to undemocratic regimes and nations on the U.S. State Department's list of human rights abusers. Tell Congress and the President it's time to stop selling weapons to dictators and governments that turn U.S. weapons on civilian populations. We need a new foreign policy, one that reflects America's values and goodwill, one that relies more on patient diplomacy and humanitarian assistance and far less on weapons and war. P.S. - Now, faced with war raging in the Middle East, a region awash in U.S. weapons, it is time again to push Congress and the Obama administration to end the practice of arming dictators and human rights abusers. Stop the weapons sales to dictators and human rights abusers. This is my considered assessment a little in advance of the imminent thirteenth anniversary of the unofficial initiation of the continuing horrid saga highlighted to date by the notorious state crimes actualized on September 11, 2001. The question I’m posing in “celebration”, in light of current “event” sequences, is: Are We Being Hosed, or Had? And my own answer is: Yes, almost certainly. I have repeated too many times to mention the refrain that all of our so-called “news” – not just all of our international news, not just all of our domestic “news”, not just some of our “news”, but ALL of our “news” is totally manufactured to suit the precise specifications of the “state” (“state” referring in this case specifically to the “New World Order” and, more precisely, the miniscule, totally psychopathic elite tightly perennially and all-but-imperceptibly directing that complex of complexes). The “news” the “state” wants for the purpose of selling its long-term agenda and mollifying its controlled masses it will create as it goes along. And what is consequently the proportion of the relationship of the wholly-manufactured so-called “news” to the unbiased truth of what is actually happening in the world? It is essentially the same as the ratio between the pork in pork and beans and a cow. To illustrate: Based on historical precedence primarily, and also on the superbly-informed alternative reportage of Dr. Michel Chossudovsky in his article I posted on this web site back on July 3, ISIS and the “Islamic Caliphate project” are extremely likely to be (just like al-Qaeda is now widely known to be) nothing more than tremendously hyped creations of the CIA and other western intelligence services. In the article I referred to, Chossudovsky informs of credible reports that the leaders of ISIS (or “ISIL”) were recruited from the more unhinged proto-Muslim fanatic elements out there and trained in the Jordanian desert in 2013 as clandestine “foot-soldiers of the western military alliance” to forward the western and Israeli goal of dismemberment of Iraq, respond to the desire for a continued and heightened role for private sector paramilitary forces, and provide renewed justification for projected “counter-terrorism operations”. So, do all of the heinously murderous and generally naïve now comprising a reported great surge internationally of common recruits know of the western sponsorship of their cartoonishly loathsome “pro-Muslim” (disastrous for Islam) units of mayhem? Of course not. Does western (including U.S.) intel order beheadings of westerners, or of anybody? Not specifically – unless it would somehow serve them. But, a beheading like that of an American photojournalist last week automatically when widely-reported becomes a core of revulsion and sparks fear that ISIS, unlike al-Qaeda, our now more-visible sometimes ally, will soon pull something equally atrocious, or a 9/11, on a mass scale here. No need for them to actually do it! It only needs to be made to look like they did to mobilize in convenient abject cowardice the vast majority of the population – something we in the budding (but never flourishing) 9/11 Truth Movement have warned they could pull on us again ever since 2001. And now, if it happens, we must believe our own warnings and proclaim and report what the lockstep media doubtless never will. Would our leaders, or who controls them, really do themselves or condone the despicable sorts of things ISIS is reported to have done? And would their (supposedly, our) media likewise denounce horrific western killings that are equally wicked and ugly? For the clear answer, read the other article that I posted on the 911grassroots.org web site today, by Gary Leech. Have any of you heard that unfathomably evil act and unknown numbers of others like it denounced on the nightly news or seen it/them splashed in red, bold headlines across daily newspapers from here to Trafalgar? No? Were such acts as these in some way less evil or did they leave their victims any less dead, defiled, or mourned by surviving relatives, if any? Were any of them actually ordered by the CIA? Probably not. But their equal counterparts selectively screamed siren-loud, emphatically: yes. The headlines out of Ferguson likewise screamed: “Riots and Violence by Angry Demonstrators”; but the stories scarcely mentioned the crowds of peaceful protesters cowed by huge war machines and drenched on American soil into submission with tear gas, a horrific agent banned from use on foreign battlefields because it’s so withering and unsusceptible of countering or defending against. Okayed for use domestically against American citizens, but never fully reported. Latest evidence again points at U.S. or, perhaps more likely, its ally, the military of the CIA-prompted gang that illegitimately displaced the elected government of Ukraine, having shot down the commercial airliner the U.S.-led west blamed hysterically on Russia. And, in apparent desperation, the U.S. administration last week ordered a Russian humanitarian aid convoy to leave the eastern part of Ukraine or face “serious consequences” – as if either eventuality was likely to happen. And Gaza – don’t get me started! So, do I suspect that ISIS is the real threat to our and world safety and continued existence, or more-of-same? More-of-same. Let us not be had ever again! War Isn't Working – Tell the Senate Now, "23 years – Enough Already!" The United States has been bombing Iraq off and on (mostly on) for about twenty-three, yes 23, years. Has it worked? Is Iraq peaceful, stable, secure? Have we eliminated potential threats to the U.S. and our allies, or have we exacerbated them? Has U.S. military engagement in the region, whether by bombing, invasion, occupation or providing weapons transfers and military aid, been effective? I think “abject failure” is the only way to describe U.S. policy. Can we afford to keep doing this, at an exorbitant cost, when it’s been so spectacularly unsuccessful, and we have such pressing needs in our communities that need our attention and our tax dollars? President Obama has spoken wisely about the limits of U.S. military might to solve the problems in Iraq and the Middle East, and rules out a large troop presence on the ground, yet U.S. military actions in Iraq are escalating, and the mad momentum of war often defies presidential good intentions. Last month the House of Representatives overwhelmingly passed H. Con. Res. 105 stating clearly there is no legal authority for U.S. military involvement in Iraq without express Congressional approval. The Senate needs to do the same. Write your senators today and tell them enough is enough – stop bombing Iraq, stop flooding the region with weapons, emphasize humanitarian aid and diplomacy as the primary tools of U.S. foreign policy to bring peace and security to the region. Please act now, before another catastrophic war escalates out of control. P.S. -The Constitution grants Congress, not the president, authority over decisions to engage in war. Write your senators today and tell them to end the bombing of Iraq. Enough is enough. Alex Jones sits down with the founder of The Daily Caller, Tucker Carlson and provides him with a hard hitting crash course in the lies surrounding the September 11 attacks, covering everything from eye witness accounts, the stand down of NORAD and a bevy of alarming evidence surrounding the collapse of building 7. Molten Lead Appears Silvery In Daylight, Just Like Aluminum. 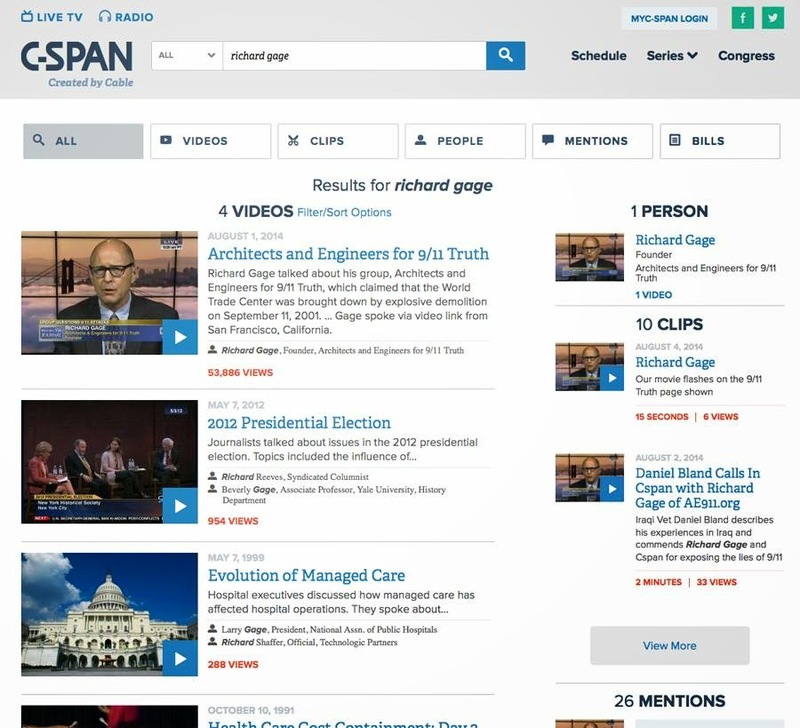 In addition to calls to CSPAN, we should keep the pressure on Dr. Sham. I left a message with Dr.Sham's receptionist asking him to answer the accusations that he is lying. Just so he knows that 9/11 Truth is not going away, and he is not going to get away with it. David Chandler during its Draft Final Report in August 2008. Mark Basile has done some work this summer. A progress report will be posted soon. 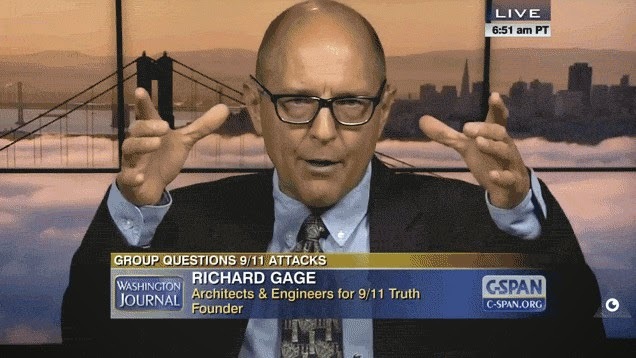 Stay tuned..
On August 1st, 2014, Richard Gage from Architects and Engineers For 911 Truth was on C-Span talking about the events of September 11, 2001 and the need for a new investigation. The very fact that public pressure led to the above interview with Richard Gage is extremely significant. It reveals a fundamental truth. People can beat the system. The system still thinks it has to lie to the public to get what it wants, so that means it does not have absolute control. If enough people want justice it will happen. A Grand Jury investigation must be launched into 911 as an act of treason. The evidence for this crime has been in the public domain for many years. Members of NIST, the 911 Commission, and those that gave false testimony during these investigations, should be brought in for questioning and charged accordingly (where the proofs of their crimes are established). Remember, the truth about 911 will most certainly END the War on Terror. The JREF forum has been plagued by technical difficulties due to neglect, and it is down and out now. It may be in the process of some hardware upgrades to keep it going, but things may not be that simple. I am getting some fairly dependable reports indicating that the JREF has finally made the decision to cut the ties to the forum, after several years of dragging its feet. I do know that this was discussed on the forum before it was shut down, and that the following rumor was going around: Some forum members and administrators may be trying to make a deal to run the forum on their own, eventually under a new forum name. JREF may help to upgrade and run the forum during the transition period, which may last a few months. If this is true, 2014 may be the last year for an official JREF forum. Looks like JREF is disowning the forum. 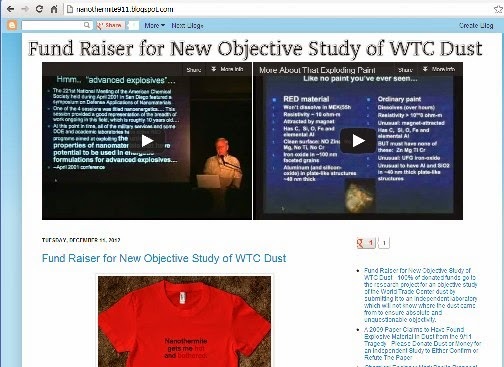 My last article was about an incident on the JREF forum where one local troll declared to the world that he could not find any data about aluminum in Dr. Harrit´s 2009 nano-thermite paper. The article reveals how a lone truther on the forum humiliated Mr. Spanx by pointing out that Harrit´s paper has been available for more than 5 years, and that it quite clearly shows the evidence for the elemental aluminum in the chips. It also shows how a fellow JREF-Troll tried to save Mr.Spanx by claiming Harrit´s data does not show aluminum in the residue from the ignited chips, and how the truther debunks that by referring to two graphs in the paper. The truther also noted how Spanx has accidentally debunked the JREF defense against the aluminum in the residue: The JREFers had previously acknowledged the aluminum in the residue, but claimed that Dr. Harrit did not prove a thermite reaction because he did not prove the aluminum in the residue is an oxide. But Mr. Spanx had unwittingly cited a paper that proves this is not necessary. In this article, I am revealing how another troll tried to save Mr. Spanx with an even more stupid comment: Enter Mr. Redwood! Instead of acknowledging Harrit´s aluminum data for the residue, Redwood tried to go back to pretending there is no aluminum in the pre-ignition data. How sophisticated! "In other words, micron-sized aluminum in thermite outperforms nano-meter sized aluminum, but formulating thermite into a gel makes it easier to ignite. That is all. Class dismissed." "All I see is a lot of posturing in an attempt to divert attention from the acknowledged aluminum revealed in figures 25 and 26 of the 2009 Bentham paper. Your "money quote", where you seem to think that the words "advanced by 68.1 deg C and 76.8 deg C" refer to the micro aluminum outperforming the nano aluminum actually refer to the fact that when the micro aluminum thermite is prepared as "normal thermite" or "simple" as it is put in table 1, and not prepared as a "nanocomposite" or a "sol-gel thermite", the IGNITION POINT is raised by about 68 and 77 degrees! Figure 5 and Table 1 in Spanx´s paper actually confirm that the nano aluminum outperforms the macro aluminum in every way: it ignites at a lower temperature, has narrower DSC peaks with more power (best of 4.3W vs best of 2.96W), and more energy (best of 1648J vs best of 955.2J)." JREF Troll Spanxed: Harrit et al Do NOT Need Aluminum-Oxide Proof. Readers sometimes wonder if some particular "debunker" is a paid disinformation agent. Sure, there are paid disinformation trolls out there, but it is good to keep in mind that most of the so-called "debunkers" are just normal people, with nothing better to do than to troll and rant anonymously on some forum, and that most of the really stupid comments are made by people that really are that stupid - au naturel. Note: this article reveals that a hostile JREF troll accidentally debunked the old JREF defense-mantra that Harrit et al failed to prove a thermite reaction because they failed to prove that the aluminum in the spheres was in the form of Al2O3 aluminum-oxide: as it turns out, this is not necessary. 1) A commenter, known as Spanx, complained on the JREF forum (July 11, 2014) that he cannot find any data for aluminum in Dr. Harrit´s 2009 nano-thermite paper. 2) The lone truther on the forum, MirageMemories, replied that the references to aluminum are easy to find. 3) Someone who likes calling himself "kid meatball" then tried to save Spanx by claiming no aluminum was found in the residue of the ignited chips. "... iron-rich spheres were found in the post-DSC residue which contained iron along with aluminum and oxygen…"
"Why doesn't the 2009 Bentham paper match known Thermite ? http://www.ysxbcn.com/down/2014/01_en/36-p0263.pdf Where is the Al in the Bentham paper ?" Dr. Harrit´s paper has been available for reading for more than five years now, and the numerous graphs and figures are quite easy to read and understand, for most people. The aluminum in the chips before ignition can be seen seen in figure 7. The finding of elemental aluminum is shown in figure 17. The aluminum in the post ignition residue is quite clearly shown in figures 25 and 26." "I am really surprised that this "no aluminum" statement is being raised. Even Oystein and Sunstealer never attempted to pretend that no aluminum can be found in Harrit´s paper. What they did try and do was claim figure 17 showed aluminum in a chip that did not match the others, and, that Harrit did not prove a thermite reaction because he does not prove that the aluminum in figures 25 and 26 is in the form of Al2O3 aluminum oxide. Your linked paper (http://www.ysxbcn.com/down/2014/01_en/36-p0263.pdf), provides an effective debunking of that argument by showing that the aluminum in the residue does NOT have to be in the form of Al2O3, because it can be found in aluminum-iron-oxygen compounds. This bears particular consideration when you look at figures 25 and 26." As always, whenever Spanx et al find themselves with stinky pants, they change the subject in the next comment and imagine this prevents people from smelling Mr. Stinky...and still some of them wonder why the forum lost its credibility years ago.. Anyone remember their former leader, Dr. Greening, and why he left in disgust?